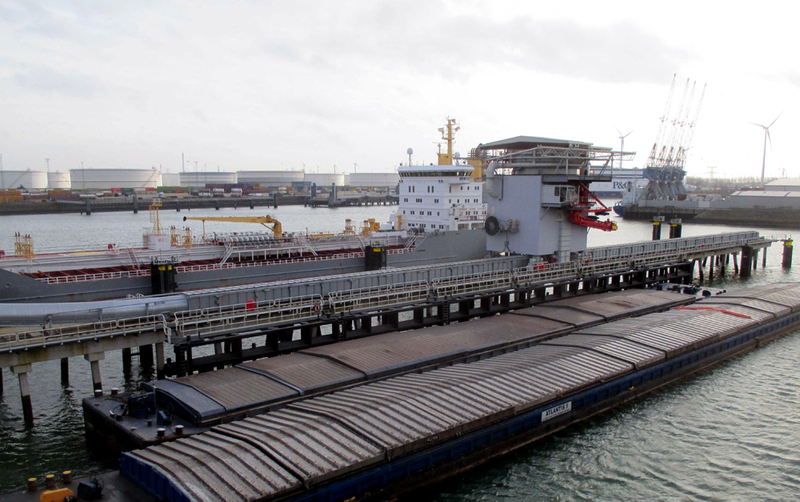 In the Europoort terminal in Rotterdam, European Bulk Services (EBS) has just put into use an innovative and large-scale unloading installation. Manufactured by Geldof, this installation is capable of unloading agricultural products, such as corn, grains, soybeans etc. from seagoing vessels straight into river vessels, resulting in higher turnover rates and subsequently, a higher overall competitiveness for the terminal operator. The 250-ton installation can process up to 1000 tons of product per hour and contains a jetty conveyor belt and an unloading hopper with weighing unit. This hopper, which is designed to be both wind- and waterproof, measures 10,5 m in width and 8 m in depth. A number of technical difficulties – such as limited construction space, height limitations and a minutely calculated load distribution – contributed to the complexity of this project, but our team met these challenges head-on. The result? A flexible and efficient system suitable for a high-tech, fast-paced environment, and a satisfied customer as the cherry on the cake.